Ruby Moon shares one half of the building pictured above. 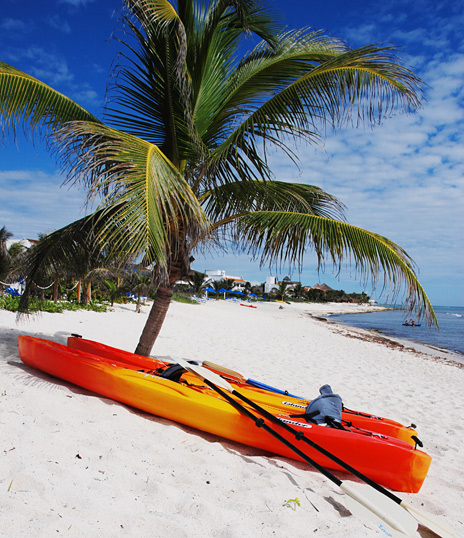 Sea kayaks are provided for guest use; and look at the pretty beach! 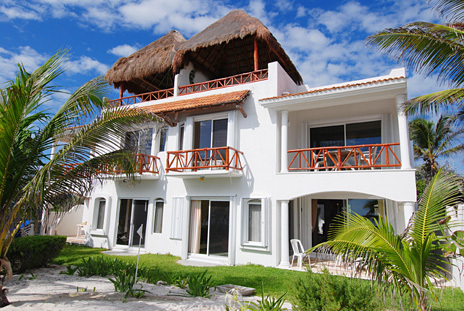 BR #1: Second level, king bed, ocean view, private bath, patio, a.c.
BR #3: Main floor, king bed, pool view, private bath, a.c. 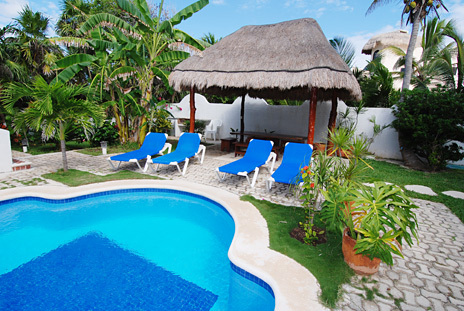 Located between Akumal and South Akumal in Jade Bay, this is a unique property that will be perfect for a family vacation or a group of friends. Jade Moon is very stylish and situated on the best part of Jade Beach with white sand beach, aquamarine water and fabulous views. Ruby Moon is a 4 BR townhouse style property with kitchen, dining room, living room, laundry room plus an outdoor covered patio with table and chairs for dining with a refreshing ocean breeze. The pool is shared with another 3 BR and 1 BR unit. The rooftop of Ruby Moon has an open palapa party room w/built-in couches, making it a perfect spot for afternoon margaritas, evening get-togethers or a relaxing massage. Just make an appointment with Lorinda and you'll enjoy have a massage to remember with the gentle sounds of waves in the background. Theres also an uncovered area for rooftop sunbathing. The swimming pool is a huge 20 X 40, 5 feet deep, surrounded by a large deck with lounge chairs; the pool is set amidst a beautiful garden. A fabulous large poolside palapa is great for outdoor dining. Barbecue some hamburgers, steaks or fresh fish; life doesn't get any better than this! 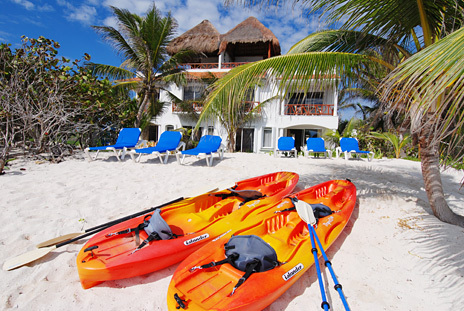 Ruby can be rented for 2 to 8 guests for your vacation on the Riviera Maya...it's an absolute gem in paradise.